Love Death Valley. I've hiked in DV many times but mostly fall/winter/early spring. I'm coming in about a week and will be hiking Telescope Peak for a 3rd time. Would like to fit another adventure in while I'm there and looking for some options, maybe another peak. Is it too hot for Pyramid Peak? Would like to get up there, never been. Was also wondering if it's possible to night hike out onto badwater basin salt flats. I've been out there late at night before but wasn't sure if it's actually discouraged or not. I was thinking about starting maybe 3am and going for a few hours and then turning around as the sun started to come up. I want to walk out under the night sky and do some photography at sunrise on the way back. I'm thinking be back in parking lot by 8-9am max. I'm open to any other suggestions that are unique and involve getting away from everyone and seeing the park. I've done Wildrose Peak, Telescope Peak, Rogers/Bennett Peak, and several of the canyons. Not looking to mountaineer or anything and probably just looking to day-hike but open to backpack suggestions. 4x4 only roads will be a major deterrent. Info like this is why I came here. Good idea, I might look around southern Sierra Nevada range. I like driving around there anyway. You can definitely hike out into the valley at night. You can reach the central marker within an hour and a half. If you try to go all the way across, you will enounter Devil's Golf Course. How is Keynot this time of year? Looking around I don't see a "recommended" season. Summitpost doesn't say anything about early June. Looks fun. Cool, I've been out there couple times late, just not this time of year. So what is it like out there late May [specifically at midnight-7am]? The temps I see look reasonable. I'm coming from more humid part of country but have experience in desert. I was at Stovepipe Wells on a day it got to 120 and it was still 110 at midnight. Dropped to 98 by the next morning. Average May 31 low is 77. I crossed the valley on a day that got up to 106. I left a little after 6AM and got to the west side by 9:30AM.....The heat caused no problems at that time of day, so if you are starting at 3AM, I am thinking you will be fine. Just bring a couple of liters of water. Great. The temps look like 70's/80's at night but that can be deceiving I'm sure. You said that 4x4 roads would be a problem. Although the road to New York Butte (where the route from the south to Keynot would start) is not super rough, high clearance is needed and there's a section where the road is tilted right above a rather steep slope. It makes me slightly uncomfortable driving through that section. You might try Mazourka Canyon. It tops out at about 8000 or 9000 feet and is really nice. Anyways, the Inyos are a lot like the Panamints during the summer. If you like hiking Wildrose and Telescope, then some of the peaks in the Inyos might be worth a try although there generally aren't trails as nice as the ones to Wildrose and Telescope. I see. Obviously I'm not from around here. Looking at some options around that side of park, even if not within DV proper. I'll have a day and a half worth of time. Too late to reply perhaps, but FWIW... I climbed Keynot Peak (finally!) from Union Wash on June 21, 2017. I didn't make note of the temperature when I started, but I imagine it was about 80. When I was on the summit, my phone said it was 107 in Lone Pine. I left my vehicle as soon as it was light enough to see the way. And returned to it just about sunset. How was it? Always warm, but never unbearably hot. I was already well up the steep ridge before the sun was shining on me. I definitely never needed a jacket at any point during the day! The Jeep was hot as hades inside, but I had an air-conditioned motel room in Lone Pine, no camping for this trip! For fun, here's a pic from the summit. 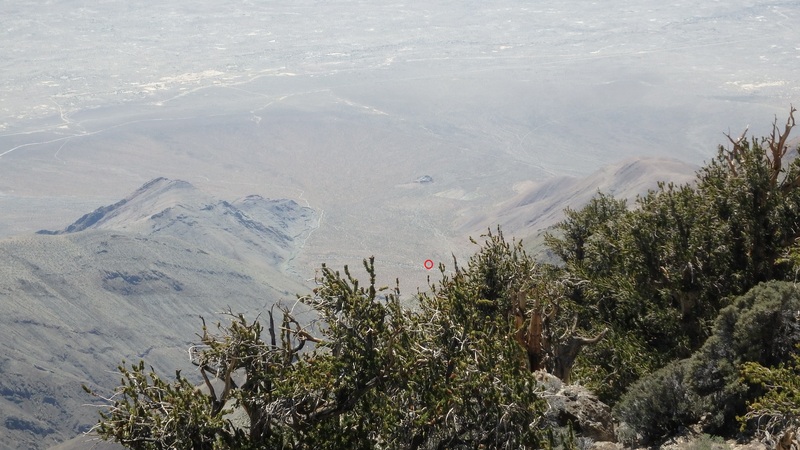 The little red circle just below the center of the photo denotes my Jeep parked several thousand feet below me.